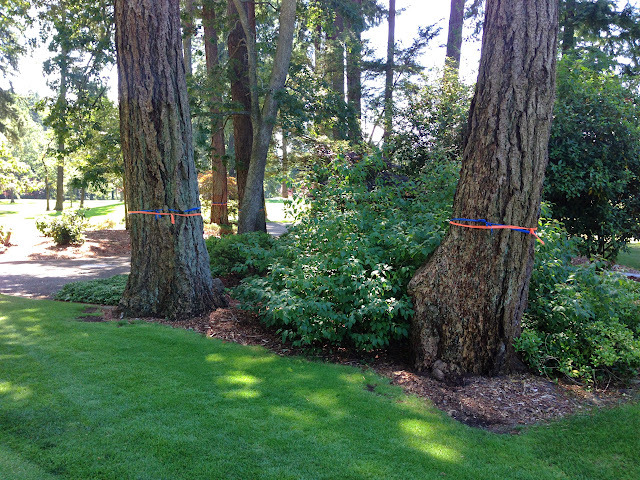 If you've been on the golf course lately, you most likely noticed some trees marked with orange ribbon like this dying hemlock tree on the right side of #1 fairway. Yes, these trees are marked because they are scheduled for removal. Currently there are over 100 trees on the golf course that are marked with ribbon and are scheduled for removal. The Club's Board of Directors recently approved the revised Tree Management Plan (TMP) presented by the Green Committee and endorsed by the City of Lakewood. The TMP has a 5 year schedule of projects aimed at managing the golf course trees. The trees marked with ribbon today are those that are involved with the first year of the plan. If you would like a copy of the TMP so that you can see the entire 5 year plan, click HERE and you can download it. A large majority of the trees scheduled for removal during year one reside in the area east of the driving range which looks like this and is obviously densely wooded. This project will be a dramatic improvement as it will eliminate the under-story of blackberries and other undesirable shrubs. That means we will reduce the habitat that is desired by critters like rats, coyotes and other vermin. In addition, by removing the under-story and many of the fir trees, the area will be maintainable while releasing over 30 threatened oak trees. 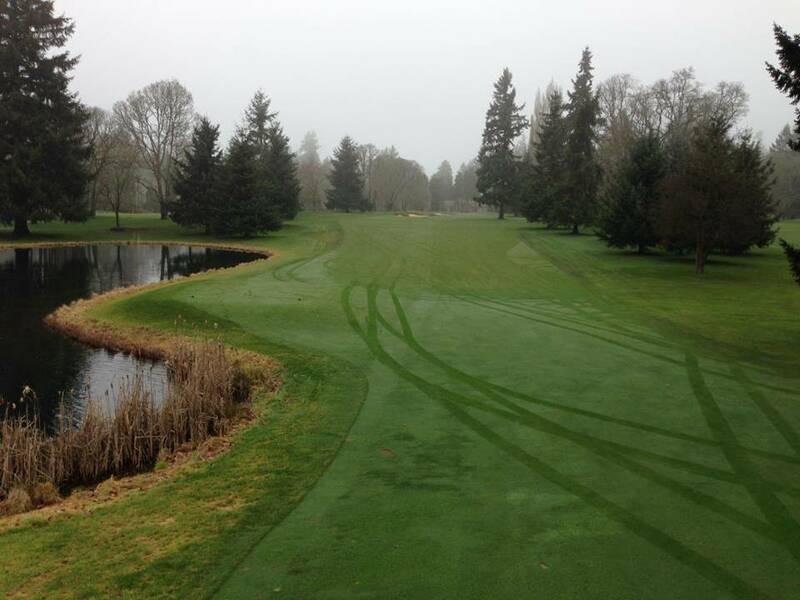 Once this area is opened up and maintainable, we will no longer loose hundreds of golf balls coming off the range tee. Releasing oak trees is the act of removing trees that are competing against the oak trees for light, water, nutrients, etc. Why are we releasing oak trees?? Oak savannas like the land the Club sits on are now one of the most rare ecosystems on the planet. All the plants and animals associated with oak savannas are now on the threatened or endangered list. So really the basic answer to the question of "why?" is simply that it is the right thing to do. Another reason to take care of the oak trees is pretty evident by looking at the above picture. An area overgrown with Douglas fir doesn't look like a very fun place to golf. When you favor the oak trees, you have to provide sunlight and air which is exactly what grass needs also. The better the grass the better the golf. Click HERE to read more on the process of oak release. Here is another picture of the area east of the range and here you can see some of the huge oak trees that will be released. This really is an exciting project. It's refreshing to be doing something that not only benefits the golf course but it actually benefits everyone. The entire community benefits when you try and preserve a threatened ecosystem because it helps maintain species diversity. Look up the term Biodiversity and you'll see just how important this concept is. Nowadays you hear a lot about the public's perception that golf courses are bad and that they are polluting our environment. Many of those people will never be convinced to the contrary, but they would have to admit that Tacoma C&GC is different. They would have to say "Wow, those folks are actually choosing to make a positive impact on the environment". What they also should know is that the Club has been doing this for quite a while. Do any of you remember the project east of the 3rd green. In 2009 several oaks were released between the 3rd green and the 4th tee. This picture shows some of those oaks as we were restoring the area. Now today go check out these oaks as your walking to the 4th tee. They have really turned the corner and are putting on a lot of new growth. Remember also in 2009 the project east of the first green. 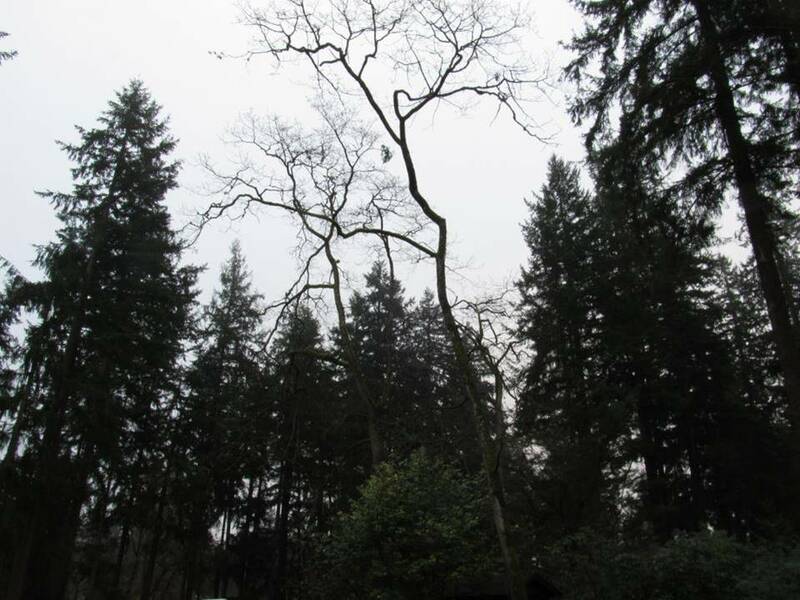 Those two little oaks in the center of the picture above used to be surrounded by firs. Of course the turf on the green is much happier also. Maybe you remember the project near the 2nd tee. It wasn't too long ago but the oaks released there have to be some of the nicest specimens on the property. This is what they look liked right after being released. It's going to be fun watching these trees flourish in the future. 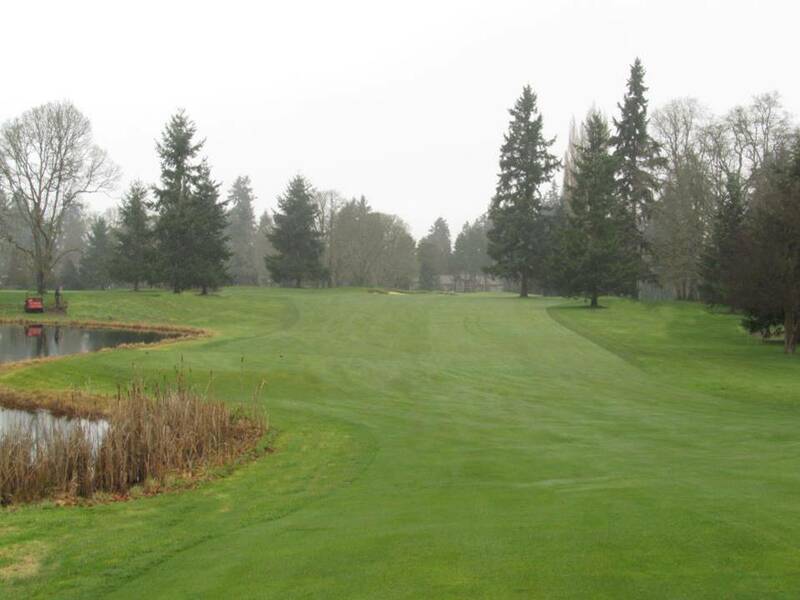 On 13 we were very proactive by releasing the oaks near 15 tee which had yet to be overtopped by the firs. Because the Douglas fir grows so rapidly, it wouldn't have been long before these trees overtopped the nearby oaks. Removing the firs now while they are small is much more financially responsible. Here's an after picture and you can see on the left side of the photo those oaks near 15 tee are now in the open and loving life. By far one of the most successful "release" projects was when the new 11th tee was constructed. Check out these pictures. The 11th tee is surrounded by oak trees which now have a chance to live for our future generations to enjoy. I seriously feel blessed to have been involved with these projects and so excited to do more with the new TMP. You can imagine most Golf Course Superintendents don't have a chance to do something that is not only good for the golf course, but also good for everyone. The new Tree Management Plan is just that.....A Win Win all around.